OBAMA, NOSTRADAMUS & JEANE DIXON: WORDS 01: RAY MABUS WILL SOON DIE? RAPIS & CHYREN. These words may be anagrams of Paris (French city) and Henry. +Appearance of a comet in the sky. +Logically Mabus must be a special human being. +The question is: Are there any person named Mabus? . +And that person has any important political or military responsibility? 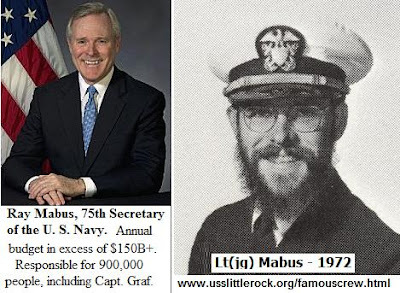 On March 27, 2009, Mabus was nominated by President Obama as Secretary of the Department of the Navy. He was sworn in on May 19, 2009,and held a ceremonial swearing in at Washington Navy Yard on June 18, 2009 where he was re-sworn in by the Secretary of Defense Robert Gates. "In his nearly five years in the job, Mabus has been the catalyst for change for a force that wasn’t just losing its global reach when he took the helm, but its size and reputation. Mabus, who served as a naval officer in the 1970s, grew up far from the sea in north Mississippi, and after graduating from Harvard in 1976, embarked upon a political career. He served as Mississippi’s state auditor from 1984 to 1988, then governor from 1988 to 1992, and revealed a powerful bent for wise public spending and for holding people to account. During his stint as auditor, he helped send 55 supervisors in 25 counties to jail as part of a huge FBI sting that recovered millions in misspent and stolen public funds. After losing his bid for re-election in 1991, Mabus embarked upon various global business endeavors before being tapped by Obama to be secretary of the Navy. Once on board, he left no doubt as to his priorities: He was determined to ensure that the Navy dominates the high seas far into the foreseeable future, even in the face of significant budgetary constraints." Can this be so easy to solve? Coming in 2013: The Comet of the Century? By Michael D. Lemonick, Dec. 20, 2012. TIME. "Within days after a new comet is first discovered, astronomers can tell you exactly what its path through the solar system will look like. They can calculate when it will make its closest approach to the Sun, how near it will be to Earth at any given moment and even when — or whether — it’s likely to make a return visit. What they can’t say for sure is how brilliant a show it will put on for us. Back in the 1970’s, Comet Kohoutek was billed as the “Comet of the Century,” but it turned out to be so disappointing that it ended up as a laugh line for Johnny Carson on the Tonight Show. Even a well-known comet like Halley’s, whose 1986 appearance was ballyhooed years in advance, can turn out to be a dud." It may be the prophesied comet or not. Update july 27 2014. NOT, will be another comet. +Ray Mabus will die in the next few weeks or months or Years ? +It's an amazing coincidence in space and time, it is almost unbelievable. +It is one thing does not appear in an astrological chart. +Nostradamus not explains how MABUS must die, he just explains what will happen after. +Almost everyone says that "Mabus" is Obama, but if "Mabus" is "Raymond E. Mabus" ? MABUS must die and no one can prevent it. And Obama will go to Israel soon riding his beast. By the way, I do not wish the death of Ray Mabus. This is a strange coincidence. I nor wish the suicide of Edward J. Snowden but after visiting Israel at Easter, now is the episode of Judas Iscariot in Obama's life as prophesied jeane Dixon. The death of one called "Mabus" is the prelude to a terrible defeat and vengeance, and then a amazing comet will appear in heaven. I have an explanation for the term MABUS. It seems that it is an acronym for Malaysia Airlines Boeing Ukraina Separatists. + Some people think that the truth can be hidden with a little cover-up and decoration. But as time goes by, what is true is revealed, and what is fake fades away. Oba"MA", "PU"tin, and "Si" Jing Ping of China. "Soon MABUS will die" simply means the triangular relationship between these leaders will soon end; probably not an actual person will die. Hence, I assume 2016~2017 will be the years for this to happen because that's when Obama complete his term as a President. + In these cases I prefer to use the Occam's razor (also written as Ockham's razor and in Latin "lex parsimoniae" ) is a principle of parsimony, economy, or succinctness used in problem-solving devised by William of Ockham (c. 1287–1347). It states that among competing hypotheses, the one with the fewest assumptions should be selected. Other, more complicated solutions may ultimately prove correct, but—in the absence of certainty—the fewer assumptions that are made, the better. Not really sure you can draw the conclusion Mabus is the Antichrist. the passage seems to use him simple as a marker. Currently Trump is looking to make a peace plan outside the Palestinian Authority. Standing in its way.. 83 yr president Mahmoud Abbas. Also .. when the comet shall run .. i'm not sure i would look only to the heavens. Wasn't it NOSTRADAMUS who wrote 'Man will make war in an Iron fish' A nuke or swarm of cruise missiles might fit the bill. Just saying I'm not going to lock in on one explanation, but looking at the current situation this one looks quiet feasible. 01 HENRY, THE KING OF FRANCE: THE LETTER.